This Saturday, March 30, we’ll honor and celebrate the work of physicians who serve our communities as part of National Doctors’ Day. While it officially became a day of national recognition in 1991, the observance of National Doctors’ Day dates back to March 30, 1933 in Winder, Georgia, when Eudora Brown Almond, the wife of Dr. Charles B. Almond, decided to set a day aside to honor physicians. Traditionally, people celebrate the day by thanking their physicians, mailing greeting cards, or sending flowers. The red carnation is commonly associated with the National Doctors’ Day. The first observance in 1933 included the mailing greeting cards and placing flowers on graves of deceased doctors. While National Doctors’ Day celebrates our country’s physicians, I want to also extend my gratitude to our health care teams that support our physicians in patient care. 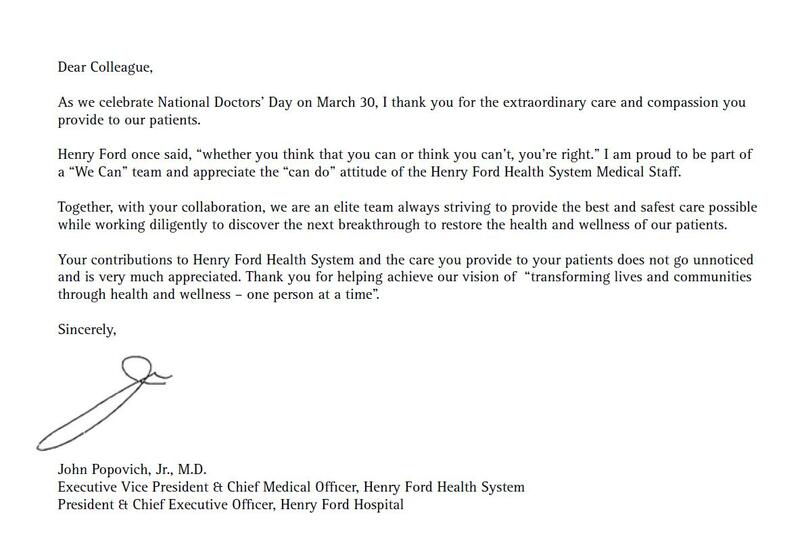 If you’d like to send a special message to or thank a Henry Ford physician, please feel free to do so in the comments section below. This entry was posted in Physicians and tagged henry ford hospital, hospital employees, National Doctor's Day, patient care by Dr. John Popovich. Bookmark the permalink. I’d like to thank Dr. Stachler for doing thyroid surgery back in Aug. 2008, Also Dr. Guthrie who did surgery on my husband June 2012. Thank you so much and God Bless You nd all the Henry Ford Drs. I would like to send a shout out to Dr. Imami for his outstanding care and treatment of my glaucoma. He has successfully brought me through two very successful surgeries and I am grateful to him for his expertise, skill, and knowledge. A truly great guy! Happy Doctor’s Day! A very special thanks to Dr. S. Sukumar, at Pierson Clinic. She is an outstanding doctor. I refer everyone I know to her. This is because of her caring, compasionate, understanding and skill. She treats all of her patients as the most important part of her team. Thank you for taking the time and listening. Then working together to make the best treatment plan me to be healthy.